Parvin E'tesami (Persian: پروین اعتصامی‎) (March 16, 1907 – April 5, 1941), also Parvin Etesami, was a 20th-century Persian poet of Iran. According to Ali Akbar Dehkhoda, her given name was Rakhshanda (Persian: رخشنده‎). Parvin E'tesami was born in 1907 in Tabriz to Mirza Yusuf Etesami Ashtiani (E'tesam-al-Molk), who in turn was the son of Mirza Ebrahim Khan Mostawfi Etesam-al-Molk. Mirza Ebrahim Khan Mostawfi Etesam-al-Molk was originally from Ashtiyan, but moved to Tabriz and was appointed financial controller of the province of Azerbaijan by the Qajar administration. Parvin had four brothers and her mother died in 1973. Her family moved to Tehran early in her life, and in addition to the formal schooling, she obtained a solid understanding of Arabic and classical Persian literature from her father. She studied at the American Girls College in Tehran, graduated in 1924 from the Iran Bethel School, an American high school for girls. Afterwards, she taught for a while at that school. For her graduation, she wrote the poem A Twig of a Wish about the struggles facing Iranian women and the need for their education. In 1926, she received an invitation to become the tutor of the queen of the new Pahlavi court, but she refused. In 1934, she was married to a cousin of her father and moved to the city of Kermanshah. But the marriage only lasted for ten weeks and she returned to Tehran. In 1938-39 she worked for several months at the library of Danesh-Saraay-e 'Aali, today's Tarbiat Moallem University of Tehran. Her father died in 1938, and she died only three years later. She was buried near her father in Qom. Parvin E'tesami was born in 1907 in Tabriz, Iran. Her formative years were spent in Tehran where her family had moved and where she lived an extraordinarily simple and tranquil life close to her father, Yusif E'tesami (E'tesam al-Mulk). Here she gained her knowledge of the Arabic language and a solid grounding in Arabic and Persian literature. Reportedly, she started composing poetry when she was eight years old. She died in 1941. 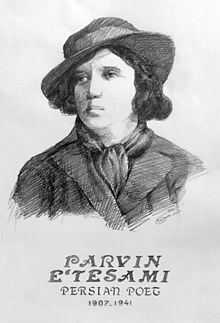 Parvin was around seven or eight years old when her poetic ability was revealed. Through her father's encouragement, she versified some literary pieces which were translated from western sources by her father. 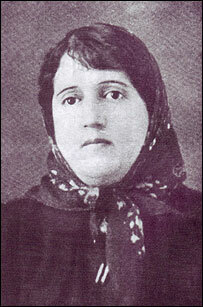 In 1921-22, some of her earliest known poems were published in the Persian magazine Bahar (Spring). The first edition of her Diwan (book of poetry) compromised 156 poems and appeared in 1935. The famous poet and scholar Mohammad Taqi Bahar wrote an introduction to her work. The second edition of her book, edited by her brother Abu'l Fatha Etesami, appeared shortly after her death in 1941. It consisted of 209 different compositions in Mathnawi, Qasida, Ghazal, and Qeta, and stanzaic forms. It totaled 5606 distiches. In her short life, she managed to achieve great fame amongst Iranians. Parvin's poetry follows the classical Persian tradition its form and substance. She remained unaffected by or perhaps ignored the modernistic trends in Persian poetry. In the arrangement of her poetry book, there are approximately 42 untitled Qasidas and Qet'as (another form of Persian poetry). These works follower a didactic and philosophical styles of Sanai and Naser Khusraw. Several other Qasidas, particularly in the description of nature show influences from the poet Manuchehri. There are also some Ghazals in her Diwan. According to Professor Heshmat Moayyad, her Safar-e ashk (Journey of a tear) counts among the finest lyrics ever written in Persian. Another form of poetry, the monazara (debate), claims the largest portions of Parvin's Divan. She composed approximately sixty-five poems in the style of monazara and seventy-five anecdotes, fables, and allegories. According to Professor Heshmat Moayyad: "Parvin wrote about men and women of different social backgrounds, a wide-ranging array of animals, birds, flowers, trees, cosmic and natural elements, objects of daily life, abstract concepts, all personified and symbolizing her wealth of ideas. Through these figures she holds up a mirror to others showing them the abuses of society and their failure in moral commitment. Likewise, in these debates she eloquently expresses her basic thoughts about life and death, social justice, ethics, education, and the supreme importance of knowledge". Parvin E`tesami began writing poetry from a young age; her first published works appeared in the Iranian magazine Baharin the early 1920s, when she was just a teenager. Throughout her life, E`tesami’s work was a marriage of the traditional and modern; while her poetic style eschewed the new modernist styles and adhered closely to the forms and structures of classical Persian poetry. ^ a b c Heshmat Moayyad. Parvin Etesami. Encyclopædia Iranica. Retrieved April 4, 2010. ^ C. Kramarae and D. Splender (2000). Routledge International Encyclopedia of Women: Global Women's Issues. Routledge. p. 1273. ISBN 0-415-92091-4. ^ Heshmat Moayyad. "Etesami, Mirza Yusuf Khan Ashtiani, Etesam-al-Molk". Encyclopedia Iranica. Retrieved April 4, 2010. ^ Bagheri Narges, Parivash Mirzaeian (December 2013). "A GLIMPSE TO THE FEMALE- ORIENTED CRITICISM IN PERSIAN LITERARY RESEARCHES" (PDF). 1. European Centre for Research Training and Development UK: 72–88. E'tesami, Parvin, a brief biography by Professor Iraj Bashiri, University of Minnesota. This page was last edited on 26 January 2019, at 08:27 (UTC).